Noodle is a comfort food for me. I will never have enough of it. 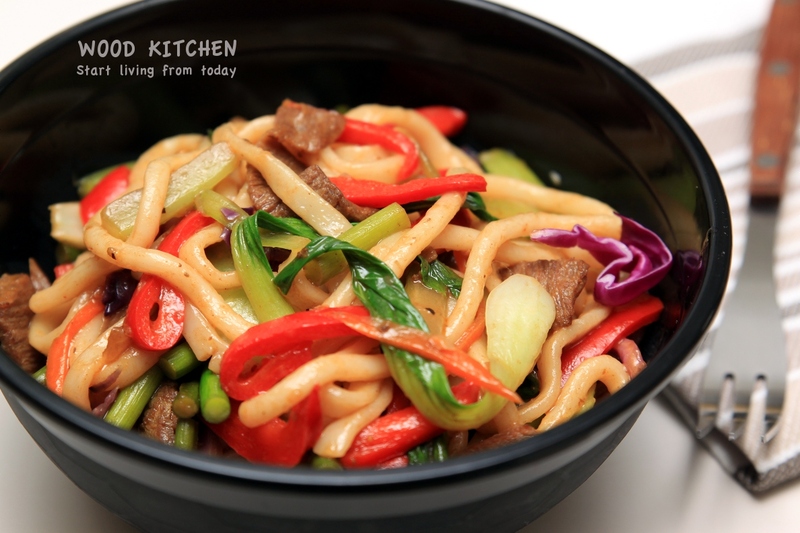 Udon noodles (2 pack), sliced beef (100 g), garlic shoots (150 g), capsicum (1), Spanish onion (1), celery (2 stick), shredded purple cabbage (a handful), bok choy (2), shredded carrot (a handful), cayenne pepper (1/4 teaspoon), ginger powder (1/2 teaspoon), black pepper (1/2 teaspoon), soy sauce (2 tablespoon), canola oil (4 tablespoon), salt. To marinade beef, place sliced beef in a bowl. Add cayenne pepper, ginger powder, black pepper, soy sauce (1 table spoon), canola oil (1 table spoon). Place a medium pot of water onto boil. Cook undo noodle according to its package instruction. Set aside. Heat 1 table spoon canola oil in a large pan and fry beef, Turn off the heat as soon as all the beef change colour. Remove from pan and set aside. In the same pan add the rest of canola oil over high heat. Add celery and cook for 1-2 minutes. Then add Spanish onion and garlic shoots and capsicum, cook for 1-2 minutes. Followed by bok choy, shredded carrot and purple cabbage, cook for another 1-2 minutes. Finally, add soy sauce (1 table spoon), cooked undo noodle and beef. Season with salt and pepper. Toss everything together and turn off the heat. Thank you for sharing your delicious udon noodles with the Fiesta Friday crowd over at Angie’s The Novice Gardener blog. Today is Part 2 of the special anniversary edition and your noodles are a very welcome addition to the table. Simple fresh and delicious. This would make a great side or paired with a protein an awesome meal. Those noodles with crisp vegetables are one of my favourite meals. It’s been too long since I’ve had them, so will follow your example, and recipe now.